Stobby's trying to loose weight. 10 lbs to be exact. According to Lance Armstrong's Live Strong website she can do this by either dropping 500 calories/day from her diet or increasing the amount of exercise she does. Stobby opted for the latter. On Monday she went for a 15 min/mile walk for an hour; on Tuesday she went swimming for 1/2 hour; on Wednesday she went for a 5 km run (we won't tell how long that took) and today she's going for a bike ride. My lunch has surreptitiously shifted in calories. By three cookies to be exact. "WHAT?? Oh my gosh, someone get me a toilet!" A quick check on the back, to figure out what the hell's going on with my ramen noodles, reveals a new way of measuring calories. It turned out 273 calories represents 70 grams, the amount in one package. 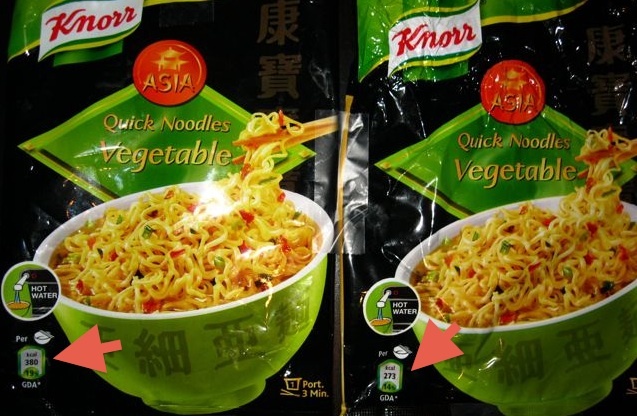 For some twisted reason, Knorr has now decided to tell consumers the caloric intake of 180 grams. Uh....ok. Sure, why not? Throw in a beer and a couple apple pies, while you're at it. It makes no sense why they would add on calories I'm not actually consuming. It also irritates me to realize that while I'm patting myself on the back for being so diligent, I also not questioning how suspiciously easy this diet is. Oh, Stobby....the world's smallest violin is playing your song. Good for you for upping the exercise and being so careful about caloric intake! I have to get back to both of these, since I originally had ten pounds to lose and now it's fourteen! I bought a little carton of Ben and Jerry's ice cream, so I wouldn't eat a big carton in 3 days. The calorie count on the little box looked good--250 calories per serving. Great! Then after I eat the entire box in one sitting I noticed there were 4 services in that little carton and I'd actually consumed 1,000 calories! Do with it what you will but I hope you enjoy it! @Susan- thanks for the encouragement! @Marilyn- LOL! 1000 calories?!! What was the flavour? Hamburger? Losing weight I think is the hardest thing I've ever had to do. I wish you luck in tackling your goals. I need to lose much more than 10-pounds and I always get cravings at odd times of the day which seem to ruin my efforts. Losing weight means monitoring caloric intake: replacing some meals with protein shakes, drinking a lot of water, eating veggies. I know people who tried for years to get rid of the fat. Once they took the above steps, the weight fell and stayed off. Building muscle to rev up metabolism, and aerobic activity to burn fat are also necessary for health and that toned look - but discipline over food is really number one. @ Michael...yah, I'm starting to notice that anything in the cupboards winds up in my mouth. @ Amy....discipline is the golden word! @eastbaywriter....thank you very much for the nomination. That's very sweet!